As part of their 2018-2019 professional learning goals at PA Distance Learning Charter School, school counselors, Ms. Morgan Jasin and Ms. Katie Griffith organized and led a School Counselor Best Practices for Student Engagement symposium. 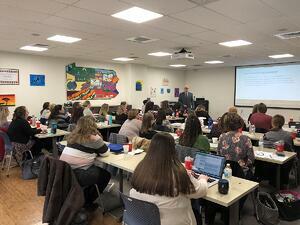 The event took place March 6, 2019 with more than 40 counselors from 12 different cyber schools gathered at 21st Century Cyber Charter School in Downingtown, PA.
Ms. Jasin and Ms. Griffith organized keynote speaker, Joe Dagney. Mr. Dagney is a school counselor at Central Montco Technical High School and professor at West Chester University in the School of Counselor Education. He uplifted the school counselors by getting them energized for the day with four goals in mind for our students: success, curiosity, originality and relationships. Each counselor in the room shared what student engagement meant to them in their role, leaving the energy high to learn more. Three other school counselor presentations followed on the topics of virtual group counseling, student assistance program in the cyber setting, and trauma-informed care. The day ended with panel discussions on topics including, career-to-work, Chapter 339, student engagement, social involvement, and more. The common theme of the day was understanding and support for one another in our positions as cyber school counselors. A shared consensus arose that it would be extremely beneficial to have annual meetings with cyber school counselors to best benefit the needs of this incredible population of students.